Pat's Fantasy Hotlist: More inexpensive ebook goodies! You can now get your hands on the digital edition of Kristen Britain's Green Rider, first volume in the NYT bestselling Green Rider series, for only 2.99$ here. You can download it for the same price in Canada here. On her long journey home from school after a fight which will surely lead to her expulsion, Karigan G'ladheon ponders her future as she trudges through the immense forest called Green Cloak. But her thoughts are interrupted by a galloping horse bursting from the woods, its rider impaled by two black-shafted arrows. As the young man lies dying on the road, he tells Karigan he is a Green Rider, one of the legendary messengers of King Zachary. Before he dies, he makes Karigan swear to deliver the "life and death" message he’s carrying and to complete his mission "for love of her country." 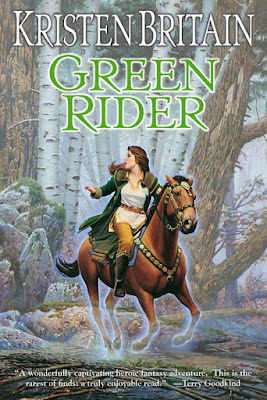 The man gives her his green coat, with the symbolic brooch of his office, bestowing upon Karigan the title of Green Rider and changing her life forever. Caught up in a world of deadly danger and complex magic, compelled by forces she cannot understand, Karigan is hounded by dark beings bent on seeing that the message, and its reluctant carrier, never reach their destination. 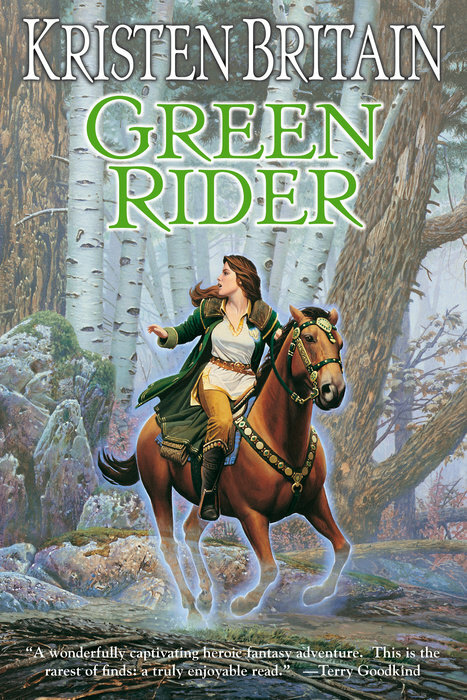 Green Rider is the first installment of the acclaimed Green Rider series.